3. Break the story on a real Newsoutlet: e.g. the Daily Beast. 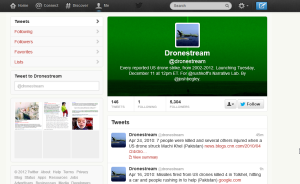 I’m going to tweet the entire history of US drone strikes tomorrow. 10 years in 10 minutes, starting at 12pm. Follow @dronestream for more.